Labour Minister Bandaru Dattatreya today said that the Finance Ministry has approved 8.65 per cent interest rate on EPF for 2016-17. The ratification of the 8.65 per cent on EPF will enable the retirement fund body EPFO to credit this rate of return into the accounts of four crore subscribers. "Finance Ministry has agreed to 8.65 per cent rate of interest. Now, the communication will come. The formal discussions are over," the minister said. He further added, "We will immediately issue the notification and credit the rate of interest to over four crore subscribers." 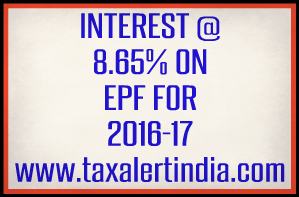 The Employees' Provident Fund Organisation trustees had approved 8.65 per cent rate on EPF in December last year.